DAYTONA BEACH, Florida -- The Florida Highway Patrol is reporting that 17-year-old Meredith Smith of Palm Coast, Florida, and an 18-year-old man from Bunnell, Florida, have died as a result of injuries they sustained in a multi-vehicle accident on I-95 just north of Daytona Beach, Florida. Around 10:15 p.m. Thursday, three vehicles were traveling south on I-95 two miles south of State Road 40. 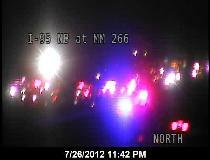 FHP says all three vehicles collided in the left lane if I-95. 22-year-old Louis Nicholas Prinzo of Ormond Beach, Florida, who was driving a 1996 Ford 4-door, suffered critical injuries. 30-year-old Doron Nirel Lyn from New York, who was driving a 1991 Chevrolet Blazer, also suffered critical injuries. 20-year-old Tuesday Coulter of Bunnell, Florida, who was riding in a 1999 Ford F150 with Smith and the yet-to-be-identified male driver, suffered serious injuries. Prinzo, Lyn, and Coulter were all transported to Halifax Hospital. FHP says that this accident still remains under investigation at this time.